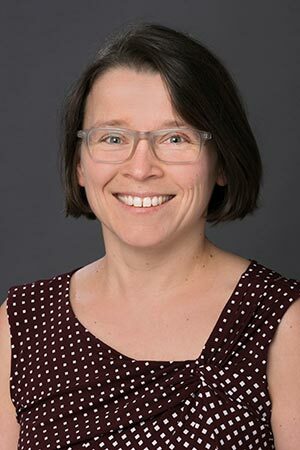 Sabine Heuer’s research interests include the exploration of linguistic and non-linguistic factors that impact adults’ performance during language comprehension tasks. She is especially interested in the assessment of attention allocation and working memory processes and their relationship to language comprehension in individuals with and without aphasia, a disorder caused by brain damage that impairs language comprehension and language production. Heuer’s goal is to contribute to the development of more carefully controlled and valid assessment materials for individuals with aphasia and related disorders. Heuer, S., Ivanova, M. V., & Hallowell, B. (2017, May). More Than the Verbal Stimulus Matters: Visual Attention in Language Assessment for People With Aphasia Using Multiple-Choice Image Displays. Journal of Speech Language and Hearing Research, 60(5), 1348. Heuer, S., & Pinke, M. L. (2017, April (2nd Quarter/Spring)). Development of an eye-tracking method to assess mental set switching in people with aphasia. Brain Injury, 31(5), 686-696. Heuer, S. (2017, January (1st Quarter/Winter)). Prognostic variables for successful lexical retrieval of treated and untreated verbs vary greatly suggesting that different cognitive processes might underlie the production of treated and untreated verbs. Evidence-Based Communication Assessment and Intervention, 11(1-2), 38-41. Heuer, S. (2016, August). The influence of image characteristics on image recognition: a comparison of photographs and line drawings. Aphasiology, 30(8), 943-961. Heuer, S., & Hallowell, B. (2015). A novel eye-tracking method to assess attention allocation in individuals with and without aphasia using a dual-task paradigm. Journal of Communication Sciences and Disorder, 55, 15-30. Heuer, S. (2009). Visual attention in a multiple-choice task: influences of image characteristics with and without presentation of a verbal stimulus. Aphasiology, 23(3), 351-363. Heuer, S., & Hallowell, B. (2007). An evaluation of test images for multiple-choice comprehension assessment in aphasia. Aphasiology, 21(9), 883-900. Willer, R., & Heuer, S. (November 2018). Changing Students’ Beliefs & Attitudes toward People with Dementia: Measuring the Impact of Service Learning.. American Speech Language Hearing Association Convention, Boston, MA. Abdeljaber, A., & Heuer, S. (November 2018). How does phonological neighborhood density influence image naming?. American Speech Language Hearing Association Convention, Boston, MA. Heuer, S., & Gunzel, C. (November 2017). Preparing Undergraduate Students as Communication Partners for People with Aphasia. American Speech-Language-Hearing Association Convention, Los Angeles, CA. Heuer, S., Hallowell, B., & Ivanova, M. (May 2016). Bottom-up influences on visual attention in image-based language tasks in people with aphasia. Clinical Aphasiology Conference, Charlottesville, VA.
Heuer, S., & Pinke, M. (November 2015). Development of an Eye-Tracking Method to Assess Cognitive Flexibility Using a Switching-Task Paradigm. Paper presented at the American Speech-Language Hearing Association Convention, Denver, CO.
Lund, S. K., Heilmann, J. J., Heuer, S., Erdmann, K., Oswald, K., Schimek, R., & Zuba, K. (November 2015). Outcome Measure Use Among Speech-Language Pathologists. Paper presented at the American Speech-Language Hearing Association Convention, Denver, CO.
Sempos, A., Heuer, S., & Lund, S. K. (November 2015). The Impact of Accessible Email on the Written Communication of People with Aphasia. Paper presented at the American Speech-Language Hearing Association Convention, Denver, CO.
Heuer, S., & Pinke, M. (August 2015). Assessment of Cogntive Functions using Eye tracking. European Conference on Eye Movements, Vienna, Austria. Heuer, S. (November 2014). Assessment of Dual-task Performance in Young and Old Adults Using Eye Tracking. ASHA 2014, Orlando, FL. Heuer, S., Ivanova, M., & Hallowell, B. (May 2014). Exploring the Relationship between Working Memory Capacity and Attention Allocation in Persons with and without Aphasia. Clinical Aphasiology Conference, St. Simmons Island, GA.
Heuer, S. (April 2014). The use of Eye Tracking to Assess Cognitive- linguistic Processes. CHS Research Colloquium, Milwaukee, WI. Heuer, S., & Wagner, K. (November 2013). Influence of image characteristics in multiple-choice image displays with presentation of a verbal stimulus. Annual Convention of the American Speech-Language-Hearing Association, Chicago, IL. Heuer, S. (November 2013). Strategies to Improve Communication with People with Dementia and Aphasia. In OSHER Lifelong Learning Institute School of Continuing Education, Milwaukee, WI. Heuer, S., Aigner, J., & Bell, K. (May 2013). Validation of a New Eye-tracking Method to Assess Attention. 2013 Meeting of the Milwaukee Chapter of the Society for Neuroscience, Milwaukee, WI. Hallowell, B., Heuer, S., & Shaw, V. (May 2013). Concurrent validation of an eyetracking-based method for assessing attention allocation. Clinical Aphasiology Conference, Tuscon, AZ. Transdisciplinary Challenge Fellow (2014) University of Wisconsin-Milwaukee. Health Care Services 2010 Legen Award (2011, January 3) Consonus. Legend Award recipient for outstanding contributions in rehabilitation services to individuals with communication deficits, Milwaukee, OR (2010) Consonus Health Care Services. Outstanding Graduate Doctoral Student Leader (2009, May) Ohio University. Student Fellowship in Clinical Aphasiology (2009, May) NIH / NIDCD. SRSAA (2008, December) Ohio University. Graduate Student Senate Awards (2008, October) Ohio University. Ph.D. Fellowship in Neurogenic Communication Disorders (2007, January) Ohio University. SRSAA (2006, December) Ohio University. Junior Mentor (2006, June) Aphasiology Conference Steering Committee. Student Fellowship in Clinical Aphasiology (2006, June) NIH / NIDCD. SRSAA (2006, May) Ohio University. SRSAA (2006, January) Ohio University. SRSAA (2005, December) Ohio University.